This -10AN Aeroquip Pushlock line is the best available. It is used for a fuel feed in setups making ~1000whp. This -6AN Aeroquip Pushlock line is the best available. It is used for water lines for ball bearing turbos as well as a fuel feed in setups making ~600whp. This -8AN Aeroquip Pushlock line is the best available. It is used for a fuel feed in setups making ~800whp. Bosch 044 fuel pumps are used in most aftermarket turbo applications where power expectations reach into the low 600whp range. These pumps are very reliable, very capable and have no problem with fuel supply even at high pressure. We run two of these pumps on the shop race car making in excess of 800whp and they have never missed a beat! We try to run these on any car that comes in the shop looking to produce over 500whp. They are more reliable at the higher pressure than the walbro's and are an all around better pump for big power. The inlet thread is an 18X1.5mm thread pitch and the outlet is 12X1.5mm. 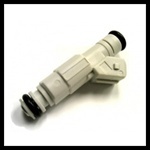 We have adapter fittings for these pumps as well for inlet/outlet with an array of sizes from -6 through -10an. These Delphi low impedance injectors are a very common choice for setups making <700whp on a 4cly or ~1000 whp on a 6cyl. These injectors fit in AEB engine code factory intake manifolds and will only fit in late audi or vw 20v manifolds if you shave down the injector cup top. These injectors are very stable and are used in many of our standalone engine management projects from 500-700whp. 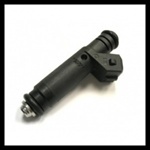 You can also use these injectors in all motor or smaller turbo setups for alternative fuels like E85. 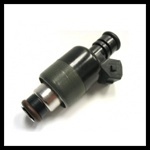 630cc injectors are the standard injector upgrade for 1.8t engines with Turbo kits. These injectors support kits up to 420whp. 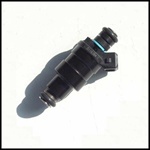 These injectors are standard for use with Unitronic 630cc Big Turbo Files. 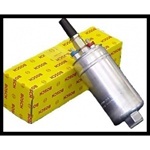 This fuel pump is the most common inline fuel pump on basic turbo upgraded cars. These pumps are fairly quiet and capable of supporting setups making ~550whp. With there fairly inexpensive cost they are the typical choice for a basic aftermaket turbo kit. Many people making over 550whp run 2 pumps together for higher power goals. The Bosch 044 pump is slightly more capable and a bit more reliable than this pump, but if you are shooting for sub 500whp MAX goals without running higher than normal fuel pressures this pump will work very well for your setup.